American - Breakfast/Brunch - FOOD - "The Delicious"
I had long been intrigued by the farm-to-table Logan Square tavern Longman & Eagle for its triple threat status as buzzed-about restaurant, bar and inn. After several failed attempts at eating a meal there (on account of their ‘no reservation’ policy and my frequently impatient stomach), I was finally able to give the place a try for brunch. It was my first time eating the down-South specialty known as “Chicken and Waffles” and I have to say I wasn’t disappointed. Longman and Eagle’s version of soul food is incredibly flavorful: the herb crusted fried chicken and fluffy waffles come with a yummy sweet potato hash (we got the no pork version). Combined with maple syrup, it’s a conveniently sweet but savory dish for the indecisive brunch-goer. 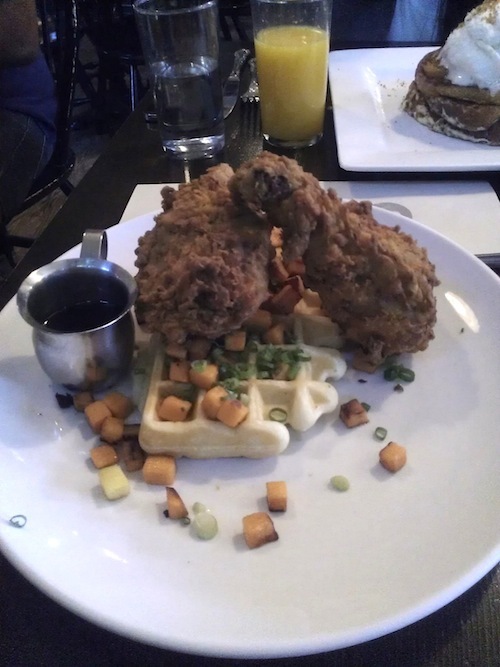 We ate it all together – chicken, waffle and syrup in each bite – which I was later told says a lot about you. What, exactly? I go big or go home. Obviously. A less exciting Cinnamon Spiced Brioche French Toast with Citrus Butter and Praline Pecans. 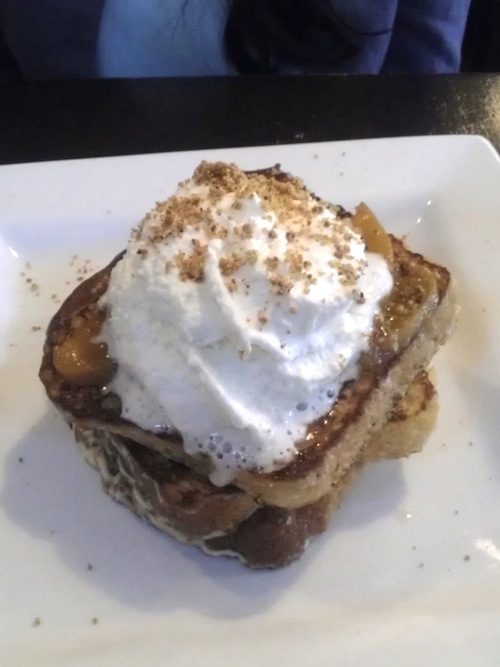 We also got the cinnamon spiced brioche French toast, which sadly was a bit on the lackluster side in comparison. Though I haven’t yet had anything on their dinner menu, I was able to indulge in several of the dessert selections on a separate occasion. 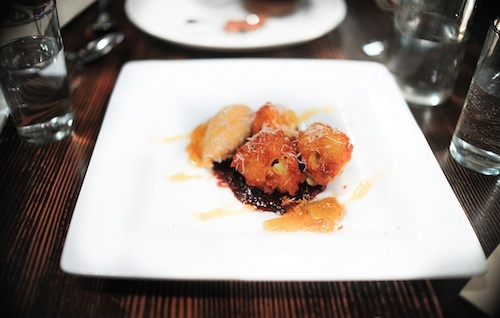 My group of friends and I devoured our plate before I could even take a picture (sorry guys, this Flickr photo below will have to do), a testament to just how amazing the warm gruyere donuts with fig jam, hazelnut mascarpone and wild flower honey were. Our other desserts of choice– the dark chocolate crispy fernet pave with malt gelato and caramel pudding and the chocolate and currant trifle with lemon and Bangladeshi bay leaf shortbread – were chock full of interesting flavors, but a smidge less successful than the donuts. The vibe at L&E is totally charming, too – the dark woods and rustic shabby chic furniture make for the perfect ambiance to warm your stomachs. And, if you actually do get seated for a meal and are thereby suffering from food coma afterwards, L&E conveniently serves as a boutique inn as well. Eat. Drink. Sleep? I’m in. Would I go back? : Yes — most definitely! How did no one else think of this before? Besides being a marketing brainchild, it’s from a trusted name — Redken for Men recently came out with their Clean Brew. It looks like beer without the alcohol of course, and it contains malt, yeast to deep clean the scalp and orange zest for shine. If you’re a wax or product user, this is great to get all the gunk (or as they say, the “grit”) out. I’m sure guys wouldn’t mind something so alpha-looking in their shampoo arsenal. And girls will appreciate it on you, because it also smells like, well…a hot guy. Or at least how I think hot guys’ hair should smell. A blend of citrus, musk and apple notes that ends up quite cologne-ey. Retails for $12 at salons. 1) Color: The hardest part was to color match my skin. In their loose powder version, I’m a Medium Beige, but that was coming off WAY too light on my skin. 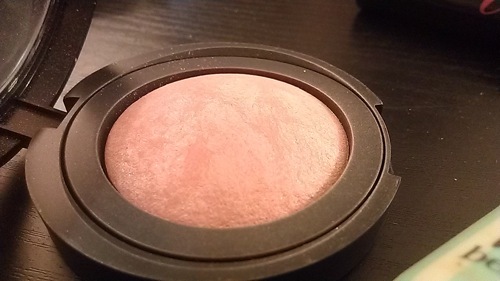 And that’s the first thing to kind of know: the colors run a little light from what you used to with their previous line, and it looks different in the pan than it does on your skin so trying it on is imperative. My roommate separately bought it without trying it on thinking she knew her color, only to come home to find it was not her color at all. If you can see above, I thought the Medium Beige looked closer to my skin but once I tried it on the Golden Tan matched way better. 2) Matte finish: If you’re used to liquid foundation which comes off more dewy, this might be something to get accustomed too. It has a matte finish, and a little goes a long way so use it sparingly. 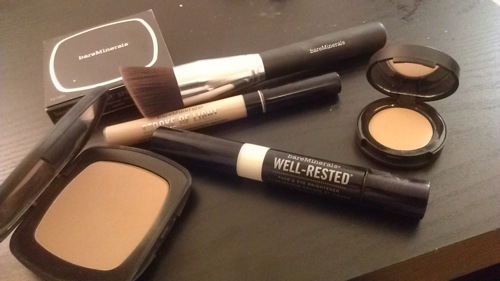 I use it with their Precision Face Brush that gives a great finish since you can buff it in your skin and also tap the makeup in lightly for an even coverage. 3) Wears way longer than the original version. One of my biggest gripes about their loose powder is having to reapply and with some of my long days that’s just not always possible. This has a long 12-hr wear. 4) Make sure to moisturize before hand (and use primer if needed). Interestingly enough, this has a mineral hydration formula to increase skin hydration by 108% after 12 hours — but it can still feel dry if you’re not used to matte formulas. I use a dense cream (like Olay Regenerist or Physicians Formula) because I feel like it helps make the makeup go one smoother and there are no dry patches. 1) I first dab their SPF 20 Correcting Concealer in Medium 2 (great for yellow undertones/olive-tan skin) around my eyes, over my eyebrows, around my nose, and over any other discoloration. This has lemon peel extract to help brighten areas over time, so it’s a great multi-tasker. 2) Before I blend, I also dab their Stroke of Light Eye Brightener around my eye area. 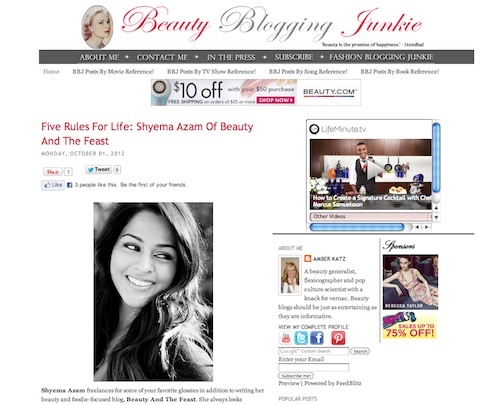 This has peptides to help fight against fine lines over time. 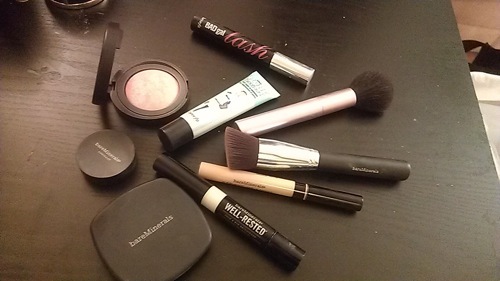 3) I blend to brighten those areas around my eyes and over my cheek bones. 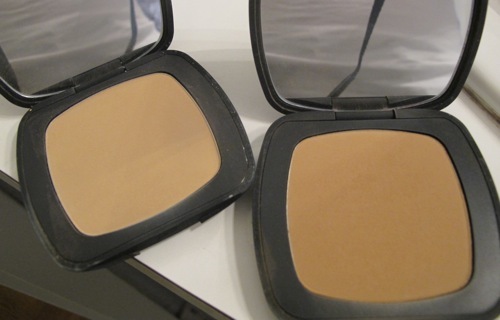 Then I apply their Ready SPF 20 Foundation all over with their Precision Face Brush. 4) I like to apply Benefit’s POREfessional over any large pores right after to even it all out. 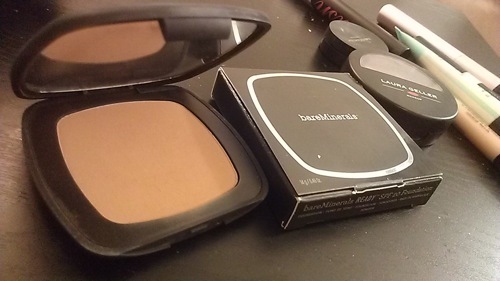 6) Finally, for a quick touch of Bare Minerals Well Rested Face & Eye Brightener on my brow bone and cheek bones and Benefit’s BadGal Lash perfects the look. If you haven’t tried this mascara…I mean, why? Have any of you tried the newest from Bare Escentuals? What did you think? For someone who lives right next to Central Park, it’s pretty sad that I’ve never been there for a picnic. In an attempt to fight a lazy Sunday, I went out for a walk. The weather was beautiful, so I called up some friends to come out and decided to have a little picnic. I raced to the grocery store and was totally confused on what to pick up — I’ve never done this before. I figured to make some iced coffee shakes, eggs, bagels, cinnamon cake, and fruits (that makes up all the food groups, right? No?). I ran home to start preparing the eggs and was so into cooking that I didn’t notice people outside started to pull out their umbrellas. Rain?! What a bummer. Since I already starting cooking I figured I’d bring this picnic inside. 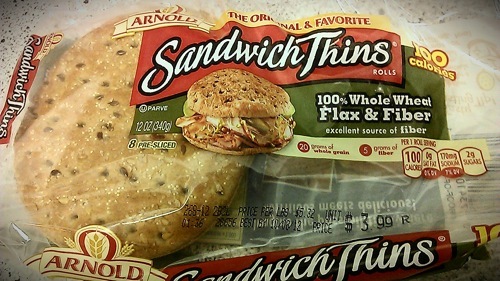 Which brings me to the amazingness of Arnold’s Sandwich Thins. 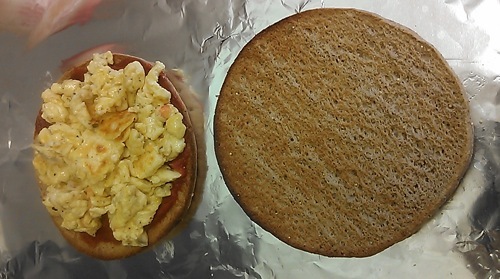 I picked up their Flaxseed & Fiber thins which made it the perfect base for my scrambled eggs sandwiches. I prepped Southwestern style scrambled eggs (red and green peppers, onions, spices) with a little big of pepperjack cheese. 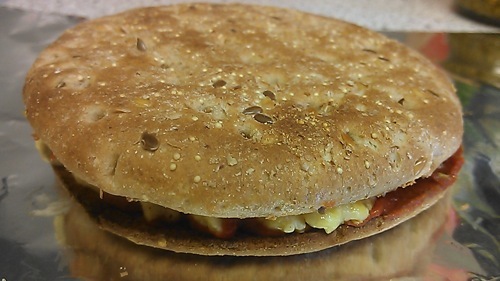 Then I toasted the sandwich thins (with thins, keep an eye on it in the toaster because they can be quick to burn!) and spread tomato paste on each half. Finally, I added just a touch of pesto spread on one half as well. Thought it turned out delicious and was so easy to make. Plus, you get your 5 grams of fiber. Maybe the picnic was a fail but at least brunch wasn’t! What would your 5 Rules be?